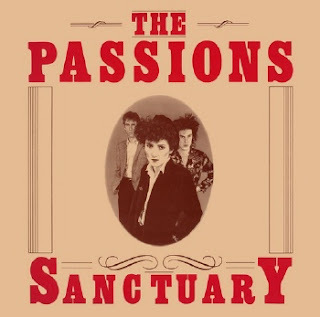 Based in Shepherds Bush, west London, The Passions' music was grounded mainly in Barbara Gogan's voice, and Clive Timperley's delicate echoplex guitar work. Before forming in 1978, most of the group's members had played in other groups. Timperley was formerly with the 101ers, whilst drummer Richard Williams and singer/guitarist Barbara Gogan were in the punk rock outfit, The Derelicts. The Passions' first single, issued in March 1979, was "Needles and Pills", which assisted in gaining a recording contract with Fiction Records. The Passions were predominantly a guitar band but they fitted in with the spirit of the times, being part New Romantics, and part "European grey". Michael and Miranda, the band's debut album was released in 1980. Singles "Hunted", and "Swimmer" followed, and then their major charting song, "I'm in Love with a German Film Star". Before "Swimmer" was issued, Bidwell and Barker left the band, the former joining The Wall. David Agar took over duties on the bass guitar. The band's second album, 30,000 Feet Over China, was released in August 1981. It included previously released A-sides and several brand new recordings. Clive Timperley left the band in Verona in December 1981, during the Italian leg of their prophetically named "Tour Till We Crack" tour, as a result of "serious political differences". The follow-up single release "Africa Mine" was recorded with a new line-up. Barbara Gogan explained the situation thus: "It's the same old story. Some bands play together for ten years and it's all very wonderful and imaginative. More often, though, you reach a point where you've done all you can do and you want to change. Whenever we've reached that point someone has always left and brought us a step further on. Any band playing their own songs to the public has a duty to change and keep being imaginative all the time". Kevin Armstrong (a contributor to a Thomas Dolby album), who had previously been with Local Heroes joined, and the group added a keyboard player, Jeff Smith, best known for his past work with Lene Lovich. Armstrong and Smith took part in the recording of the band's third album, Sanctuary, which appeared in the autumn of 1982. Stephen Wright, previously in the band Bim, joined in 1982, replacing Armstrong. The band toured Europe and the US, appeared on the Old Grey Whistle Test on BBC 2, and Whatever You Want on Channel 4, but dissolved for good in the summer of 1983, after playing their last show at London's Marquee Club on 12 August that year..
Gogan and Wright are currently playing together as The Monarchs.